Are you tired of looking at your boring living room? Do you want an upgrade, but don’t even know where to begin? Now you do! 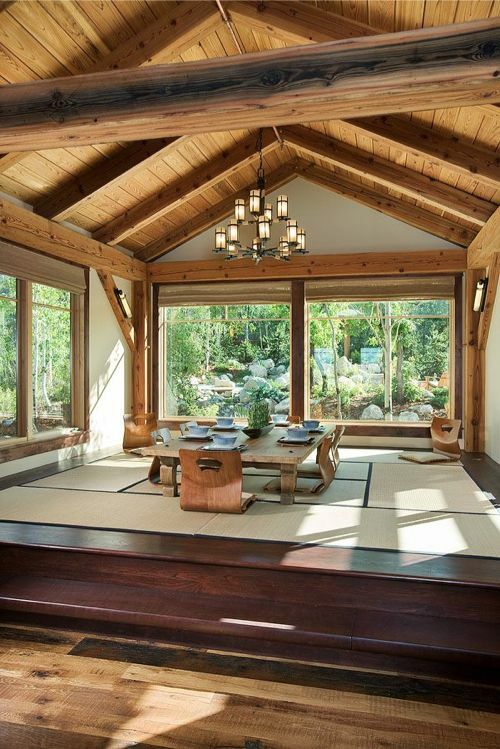 We have provided a great list of awesome dining room decor ideas to inspire your own home. 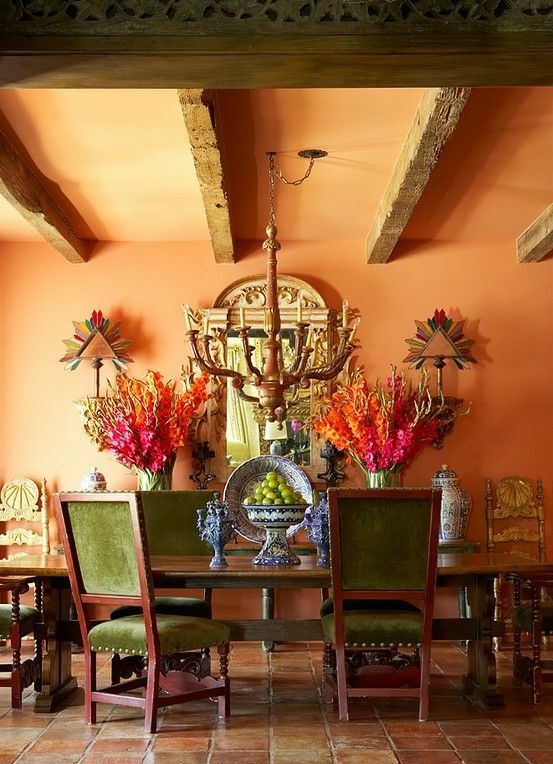 The dining room is one of the most important rooms in the house. It’s where you have family meals, play cards, and basically bond with everyone you love. 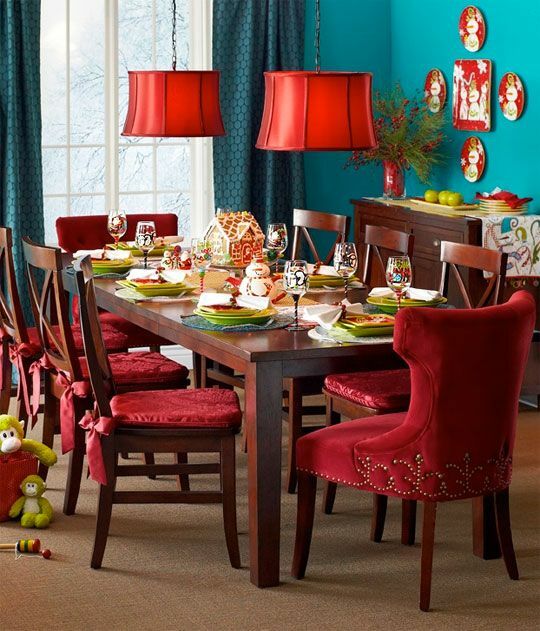 So make the dining room into a place you will love to go to, and where you will enjoy entertaining guests. 1.7 Want Some Pop?-Go With Green! 1.15 Love Game of Thrones?-Combine Past and Present. 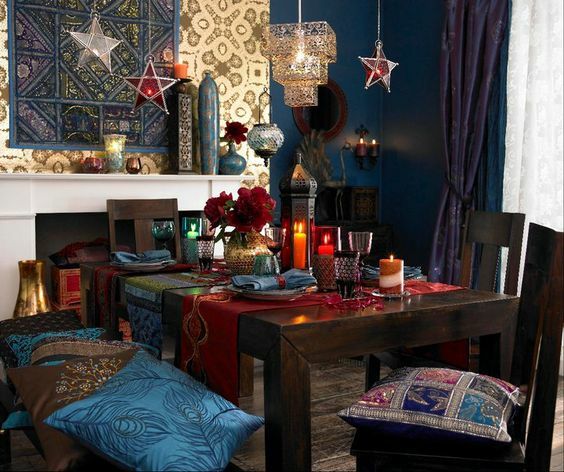 The magic that exists in this kind of decor is the fact that nothing has to match. The farmhouse feeling is one of relaxation. 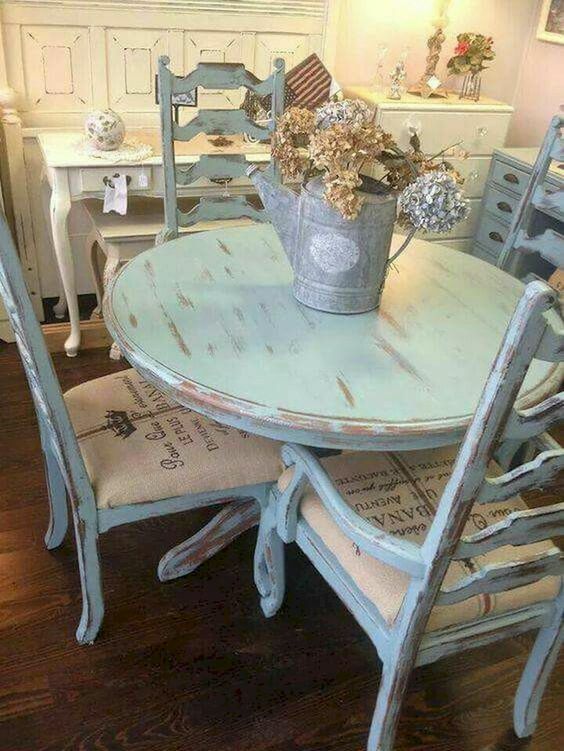 This may be one of the most fun styles to do as you can just choose the antique pieces that catch your eye and mix and match from there!. Kindly check out other similar ideas on Rooms for Rent Blog Post. This isn’t a color combination that is often, or ever, seen; but it is surprisingly attractive. Although it’s quite feminine, this look is also very modern, even eclectic. 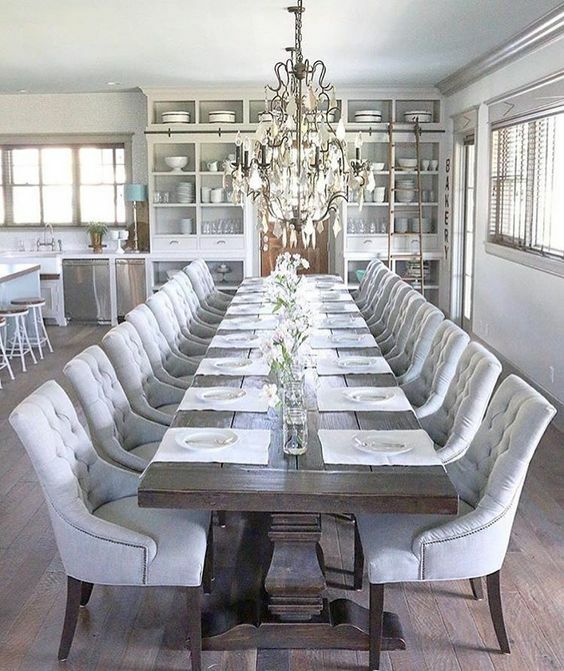 For those of you who like to go above and beyond the norm, this may just be the dining room idea you have been looking for. Find this and other similar ideas at eatwell101.com. If you find yourself trying to redecorate in cramped living conditions, fear not! There is a way, and it is not as hard as you would think. 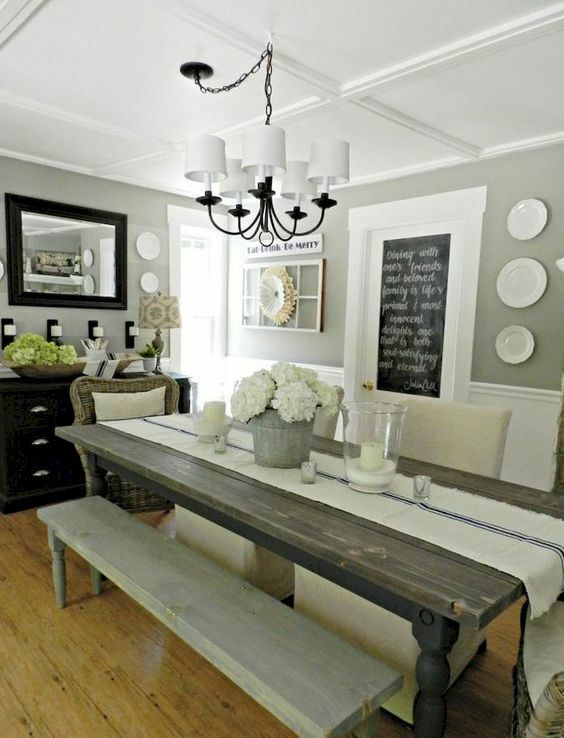 This is a great example of how to have a cute, clean dining room that will fit in any space. You don’t need to sacrifice style because you have more space than you realize! Check out more ideas at blogspot.com. 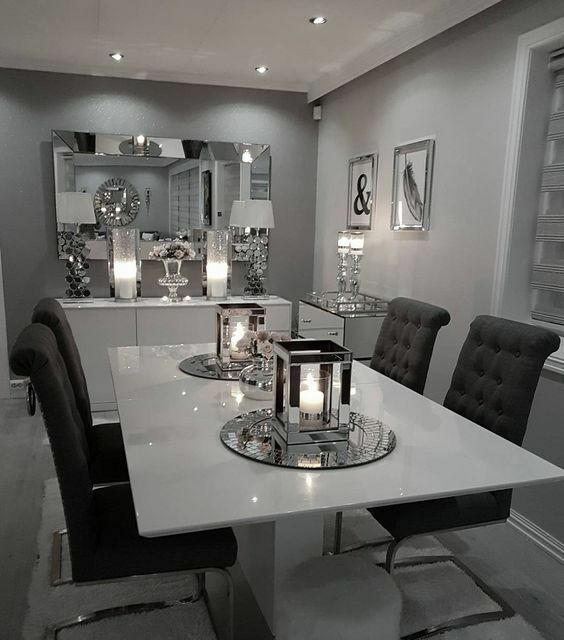 A light dove gray is the perfect color if you are looking to go for a modern and elegant dining room. Back in the day, elegant meant that you needed as many baubles and decorations as you could fit, but now simplicity reigns. That’s not to say you need to go minimalist; things like the detailed wall and lovely lamps lend a certain dignity to the tone of the room. You can see other ideas like this courtesy of taylor morrison Instagram. Even though there and endless variety of styles you could go with, sometimes traditional is just the way to go. It’s familiar and it has never gone out of style, otherwise, it wouldn’t be traditional, would it? 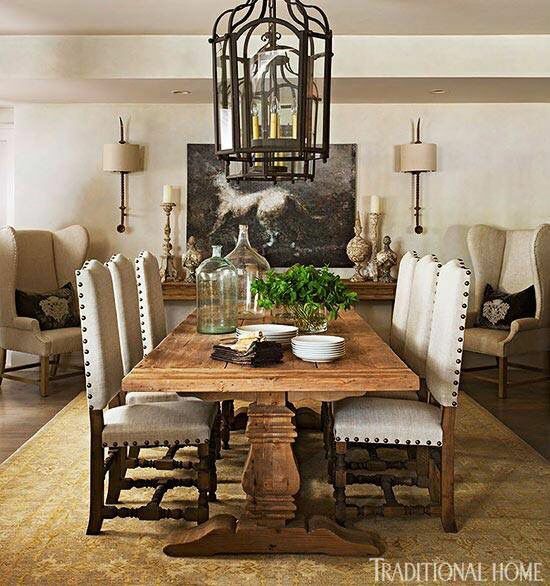 A wooden table surrounded by wooden chairs is usually the staple when going traditional. And why not? It will always be a classy decor choice. We go this great pic from bhg.com; check it out and others. It’s no secret that white has taken center stage when it comes to redecorating homes these days; for good reason. It brightens up the whole room and makes everything just feel clean. What makes it great is that it’s so easy. Basically, everything can be white and it will still look good. See other ideas from websta.me. Want Some Pop?-Go With Green! Green isn’t usually the color you think of when you want to add some pop to your design, but when applied correctly, it can come out really well! 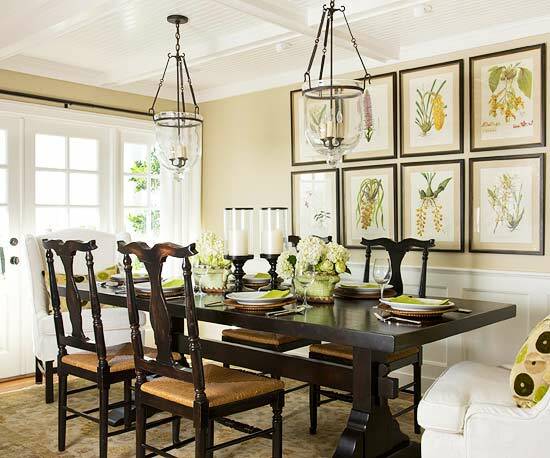 This bright and summery dining room is the perfect example to showcase the power of thinking outside the box. The gold accents against the white contrast very nicely, and bring the whole look together. Courtesy of StyleatHome.com. 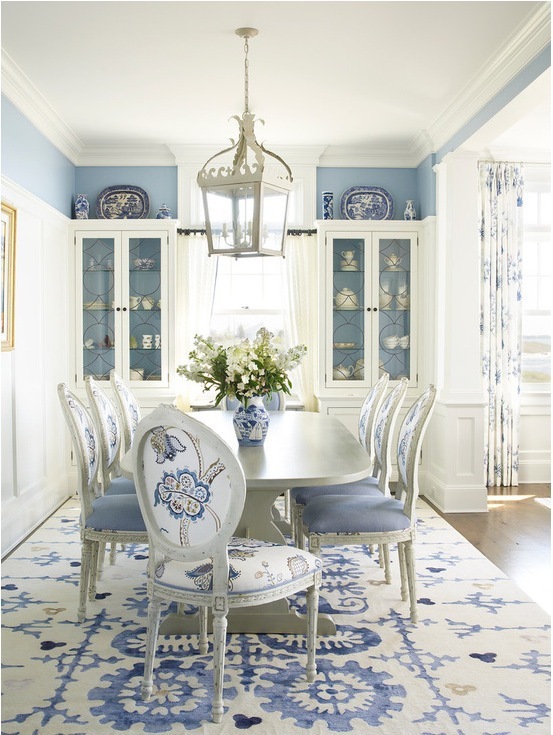 A soft blue and white room is something old yet so comforting and familiar. It can also match with lots of different styles, like rustic country, or high-end chic. These complementing colors are incredibly versatile and will make your space nice and bright while also feeling cozy and welcoming. This and others can be found on Hadley Court- Interior Design Blog. If someone were to tell you that black walls and black chairs would look great in a dining room, you would probably scoff and walk away. But seeing this picture may just change your mind. With some colorful accents, such as the light fixture and area rug, the overall dark tones seem more modern and luxurious than ominous. Check out some of these cooling ideas. 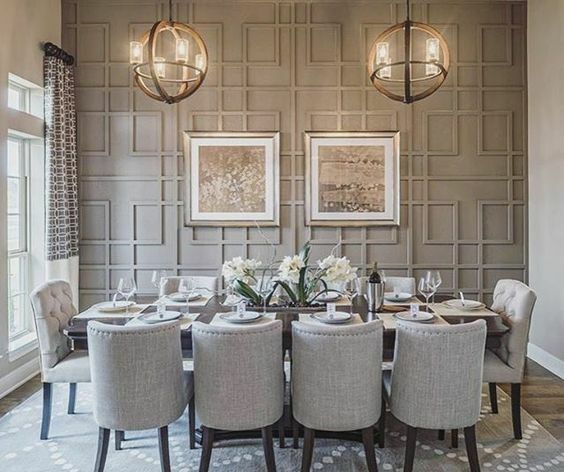 For those fans of modern decor, this dining room is the one for you. The minimalistic decor is easy to do, and the color palette is simple. This is a look that can be pulled off by anyone. 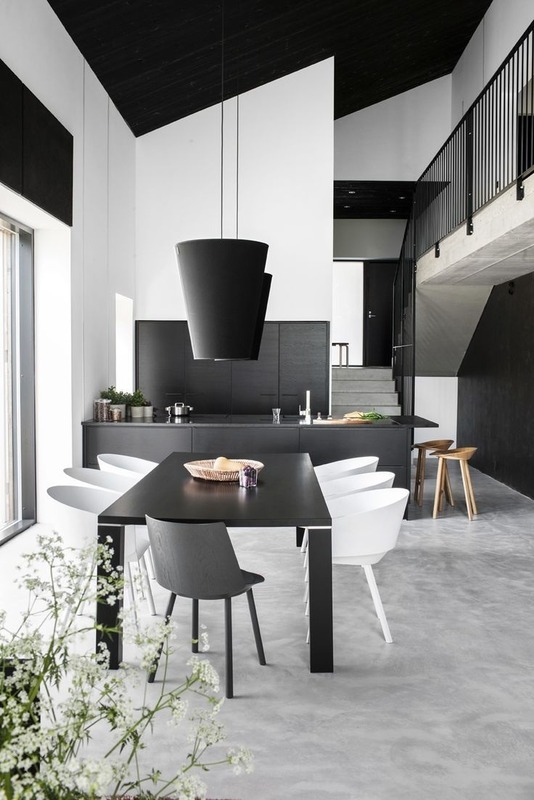 The concrete floors really tie in with the black and white furniture to create a stylish demeanor. Love Game of Thrones?-Combine Past and Present. 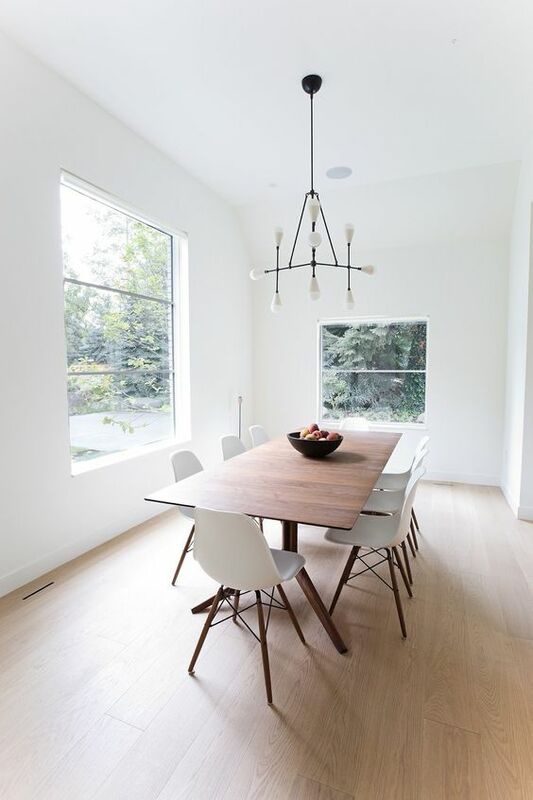 For all you minimalists out there, you can extend your style to the dining room as well. Or if you are looking to make this your new look, it’s super easy to do! The design is simple and so should the furniture be. Pull off the look with neutral colors and clean lines. 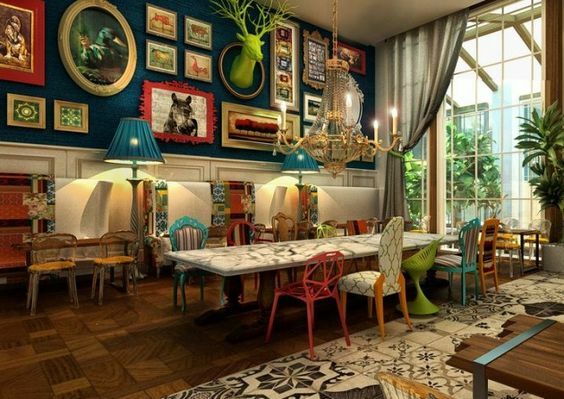 Check out other great ideas from UP Interiors . It goes perfect with this cleaning appliance at home. 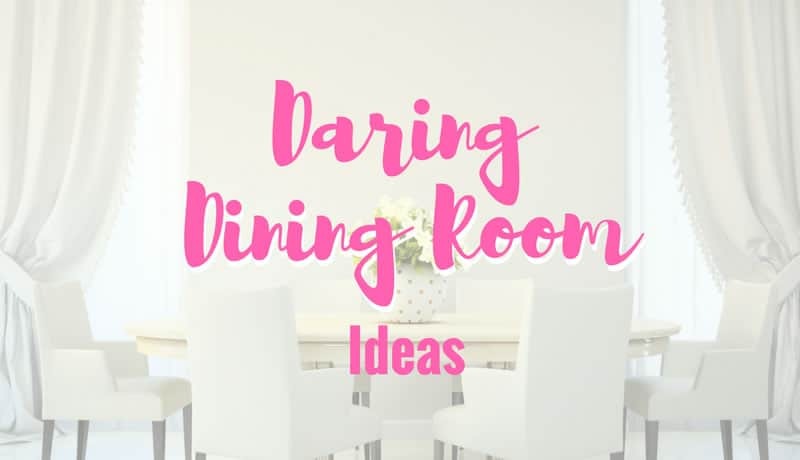 Now that you have seen a variety of dining room styles, it’s’ time to start renovating and redecorating! Whether you like lots of interesting decors, a simple table and chairs or something in between, there is a lookout there for you. I hope you have enjoyed reading this list and gathering ideas for your upcoming project. Please let us know what you thought!